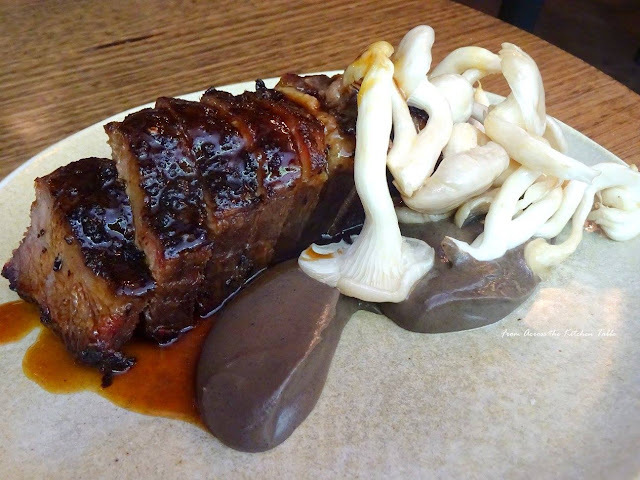 London is a city with plenty of fantastic choices when it comes to international cuisine. Irony is, with so much options deciding where to eat can be a bit of a struggle. After we visited Borough Market (separate post here), which was an absolute must in the itinerary, we chanced upon this gem of a restaurant right on the edge of the market nestled beneath the railway arch. What I especially like about the place is the wonderful exposed brick arch/ceiling, very chic yet retaining its old charm. You can also hear the rumbling of the trains overhead which added more character and drama to the place. I really loved the food, every single one of which was bursting with flavours. Whilst the dishes were tasty and delicious, the portions were small therefore you might need to order a few more or you can opt for the rest of the market if you're still feeling hungry. Do check out their stall just outside the restaurant on market days. 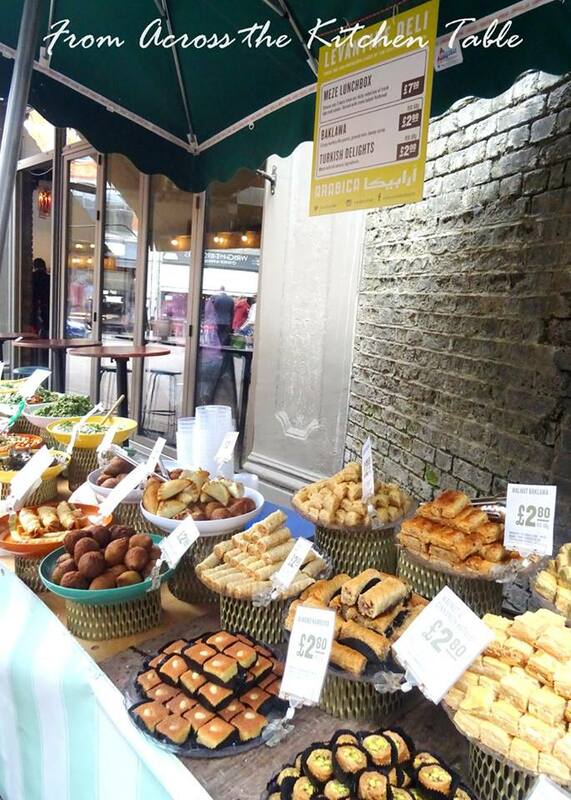 They have a range of mezze, sweets and pastries for take-away. Spiced lamb ragu, toasted pine nuts. Batata Harra, tripled cooked potatoes, peppers, onion, garlic and chilli. On market days, you can find this Arabica stall selling an assortment of Middle Eastern pastries and desserts as well as falafels and wraps outside the restaurant. We took our son to celebrate his birthday at Monopole, a two-hatted restaurant located in one of Sydney's oldest but certainly one of the coolest suburbs, Potts Point. We loved Monopole's intimate setting and their delicious tasting menu, in particular the steak tartare and charcuterie dishes. The food came in sharing platters and a few were a bit heavy so it was a good idea to share. Dishes may look simple but were packed with rich and bold flavours and tasted quite impressive. Or so the saying goes, 'good food doesn't have to look complicated to be delicious'. Can't wait for another excuse to go back. Dining at Kreta Ayer reminded me so much of Singapore and of the many family lunch gatherings I had with my siblings, just like the good old times. I miss having hawker food as well as the other Singaporean dishes that I pretty much had daily in the years that I was living there. The very thought of that aroma of charred char kway teow is enough to make my mouth water. In Malay, 'kreta ayer' means water cart and in Chinese it's called 'niu che shui'. In the early 19th and 20th centuries these ox carts were used to transport water to Chinatown. I have been to Kreta Ayer numerous times for my hawker-style food fix and the food has always been consistently fresh and good however, service can be a bit lacking. Moreover, since this is a small restaurant, seating arrangement is rather tight so you have to squeeze into your seat. The place also gets really busy during peak hours and on weekends so be prepared to queue. Spain is a country that is blessed with many excellent restaurants and Disfrutar is one of them. This restaurant has now become my favourite place to dine in this incredibly beautiful city of Barcelona. Disfrutar is run by three former El Bulli chefs de cuisine (Chefs Oriol Castro, Mateu Casanas and Eduard Xatruch). The restaurant is ranked 18th by 'The World's 50 Best Restaurants' when it first entered the list last year making it 'The Highest New Entry'. As well as receiving 2 Michelin stars in Michelin Guide 2019. From the moment I set foot inside Disfrutar, I knew that this was going to be the pinnacle of my culinary experience in Barcelona. On the way to the main dining room, we passed by the busy kitchen. My expectations were running high and Disfrutar did not disappoint. That evening was like no other. The entire experience was fun and exciting, full of surprises and no shortage of food theatrics which left all of us wanting more and wished it didn't have to end. It was truly a remarkable multi-sensory dining experience and meeting Chef Oriol Castro made it even more special. Indeed one of the best meals I've ever had anywhere in the world and certainly one that I will never forget. Lychee that was transformed into a frozen raspberry with Rose petals and dewdrops of Gin. The rose petals were not meant to be eaten, oops! This took us by surprise. It's one of many "blink and you will miss it" moments. Our server came with a bowl of black sesame seeds. She gave it a swirl and as just like magic, three beetroot meringue suddenly appeared! This was going to be fun! The waitress setting up a show-stopping tableside presentation. Smoked Apple Cider left to boil and steep. A little carved box filled with sweet surprises! These were faux olives but so fun and delightful to eat and just melts in your mouth! 'Mandarin flower essence' that was eaten after the olives. At this point, my taste buds were starting to acclimate. Smoking wood chips to give a slight smoky flavour to the apple cider. The apple cider is now poured over the smoked glass. Mille-feuille of 'Idiazabal' paired with the Smoked Apple Cider. The crispy wafer was made by frying cheese and sandwiched in between is a light foamed cream. Gazpachio Sandwich paired with sherry Vinegar that was sprayed in the wine glass. You smell the vinegar in the glass in between bites. The intention is to get that 'taste' of vinegar through smelling. The combination of flavours was unbelievable. These are no ordinary corn kernels, each sphere is filled with corn flavoured liquid that sits on top of a rectangular piece of foie gras on a wafer. 'Razor Clams with Seaweed brined in Salt' is drizzled with oil and sprayed with sherry vinegar. Another amazing dish. These delicate clams cooked with seaweed is a winner! 'Our Macaroni Pasta' with pasta made of clear gelatin mixed with ham, truffle foam and grated Parmesan. Adding whipped cream from an iSi canister and using Microplane to grate Parmesan. This 'Liquid Salad' of celery, olives and lettuce in a champagne flute was quite lovely and refreshing. It was served with 'Tomato Polvoron and Arbequina Oil Caviar' which was full of flavour. Chilled hare consomme served over an ice cube, topped with fresh orange peel and tarragon and sprayed with Armagnac. Rare with quite a strong "gamey" taste but unsurprisingly good. Another unique and interesting dish. Pandan coconut cream with mango sorbet and round mango jellies. It was light and refreshing and loaded with creamy coconut flavour. I loved this! Wow, look at that light and crisp red cone! This time, we were invited to rub our hands with whisky! Yes, whisky. Inhaling the aroma as we eat the deconstructed whisky tart.